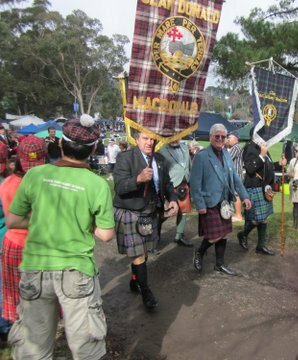 Clan Macdonald Yarraville had it's beginning in 1854 when Norman Hume Macdonald and his wife Johan MacKenzie Macdonald (nee Munro), along with their daughter Elizabeth (Bessie) began a journey across the seas to Australia. By the 1900's the couple had eleven children, living well into their 80th year, who all decided to form Clan Macdonald Yarraville in honour of their mother and father. To keep in memory the deceased parents, Norman Hume Macdonald and Johan McKenzie MacDonald (nee Munro). To foster together brother Clansmen, Blood relations, Friends, and Brother Scotsmen. To assist Scottish charities, and encourage the fostering of Scottish sentiment, and the maintenance of Scottish traditions, and customs, the auld Scots songs, and music; also the wearing of Scottish highland dress. The clan has over the years gone through many changes to reflect our willingness to accept the whims and fancies of the world around us however our core values remain the same: family, tradition and remembering the past whilst embracing the future. This being the case after our AGM in August 2018 the clan held a tour of Footscray cemetery and determined that we will as a clan retore the gravesite of Norman and Johan to its former pristine presentation. To this end we are calling for donations to assist in this endeavour and you will find a donation form on this website so that YOU can be part of this process. The grave is in a very poor state and requires a lot of work so every bit counts. Chief bid all welcome and the Chaplain George repealed the Lord's Prayer. a credit to their teacher. Haggis and other refreshments were provided for. skill as only veterans can. comic song by Mr. Shearer was well received. The mouth organ solo by Mr.
Godfrey McDonald was good, Mr. Heriot also sang in his usual form. contradict that it was the most successful gathering, held in Yarraville. Committeee and the Secretary. Bob McDonald. As Bill says - I wish we could have some photos from this get together. Richmond Gathering Tasmania 17th Feb.
Warrnambool Caledonian Society every Saturday evening Social 8.00pm. Anglican Church Hall Koroit Street.